Most importantly, don’t have an answer already in mind. GMing Dogs is a different thing from playing it. Your job as the GM is to present an interesting social situation and provoke the players into judging it. You don’t want to hobble their judgments by arguing with them about what’s right and wrong, nor by creating situations where right and wrong are obvious. You want to hear your players’ opinions, not to present your own. 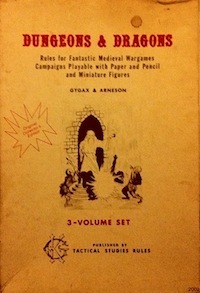 There are a number of interesting parallels here to what high-quality D&D play is for me. In a sandbox game, you don’t want to hobble the choices of players in terms of where they should go or how they should approach a problem, nor create situations where there is a clear optimal solution. There should always be interesting trade-offs, whether those trade-offs are spending more time to be more careful or taking one route rather than another. I’ve yet to play Dogs, and it’s always hard to get a sense of how an RPG will play just by reading it, but this looks to me like the social hazards are somewhat isomorphic to the D&D dungeon. Not in a plot sense, as is sometimes discussed (where dungeon-like event flow charts are created), but more like a set of potential connections between various NPCs and their interests. In D&D, making a physical choice is almost always what engages the risk/reward system, whereas in Dogs the act of judgment engages the risk/reward system. Judgment is more abstract, which is perhaps why the stake setting system is required. The same kind of thing is going on in D&D, it’s just that what is at stake is usually more obvious, and so requires less mechanical centrality. This entry was posted in Speculations on January 18, 2013 by Necropraxis. That sounds about right, though I think the choice element within D&D focuses on both resource management and manner of physical approach, if that makes sense. I’ve used the analogy of the dungeon and megadungeon for the web of social relationships in my cape-and-sword campaign. Yeah. In the system. The actual game itself is boxes though. Here’s a box. Here are the players. Go ahead and make your moral judgement. How so? Or rather, how are the boxes any different structurally than in D&D? Sure, in Dogs the GM creates some towns with NPCs and pre-baked dilemmas, much like a referee in D&D creates dungeons and lairs with challenges. Most of the time, players will find things interesting that you expected them to be interested in, but sometimes you need to improvise. I imagine the same thing is true with Dogs (again, based on reading, not playing). Ref flexibility is required in either case unless you are running a pre-plotted railroad (which, I would add, DitV is much more clear about discouraging than any published version of D&D). To further clarify, I’m not comparing the resolution systems of the two games at all. Clearly they are quite different. Players in DitV have more narrative control than D&D players. But it seems like the architecture of choice is pretty similar. Yeah last night’s game got me thinking on similar lines about D&D combat – how the decision to tackle a dangerous foe should be made with some knowledge of the risk. Same with traps obviously, and that perhaps the GM should err on the side of player creativity when dealing with traps, tough monsters rather than “realism”. The question is how far can one allow novel tactics that seem obviously flawed to work (of course they always have a chance to work)and how clear should a GM be about these chances and that they are randomizing them? As a referee, I don’t mind being transparent most of the time regarding randomization of hazardous elements (like deciding which PC a monster attacks), as long as there is always the assumption that the players may not fully understand the situation (and are not necessarily entitled to an explanation). For example, if my notes say that a particular monster hates dwarves, there is no need to tell players that information if the PCs would not know it, even if it results in the monster always going after dwarf PCs. Does that make sense? What is your preference, as a player? Do you like referees to say explicit things like there will be a 2 in 6 chance of slipping if you approach the edge of the icy cliff? Or do you prefer for the referee to just say that it looks dangerous? I know I prefer to be told and tell that it looks dangerous. In life you never know that 1/3 of the time you’ll slip, so why should I in-game? Sometimes you just don’t know your chances of doing something, or the big risk you’re walking into without realizing it. You pays your money and you takes your chances. That’s a very interesting question… As a DM, I rarely tell the players their chances, only some basic clues (“it looks rather slippery”). Before actually resolving the action, however, I often tell the players how things are about to work out mechanically. For example, if they decide to approach the edge from the previous example, before rolling, I might tell them what the consequences are going to be, if I roll 1-2 on d6. Or I may not, depending on how important I think it is; I mostly explain things when have to make ad hoc rulings or deal with more complex situations. I randomize attacks unless I don’t think I need to – i.e. someone is right in front of the beast taunting it, someone just cut it real good – I try to mention this though.